Nothing spoils a road trip like a car breakdown in the middle of nowhere. While certainly not an everyday occurrence, at some point, all of us have probably faced this problem. Usually they happen suddenly, and dealing with them are usually problematic for the driver. 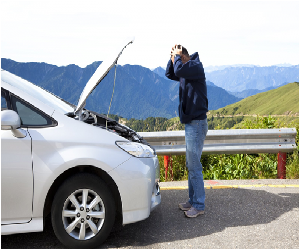 But if you are aware of the most common causes for car breakdown, you may be able to proactively avoid them. Check your car for these 5 most common causes before setting out on a trip. And, be sure to stock up with the right tools to be able to make the appropriate repairs. Dead or faulty batteries are usually the result of bad cell in the battery that doesn’t get charged properly and causes the car to die without warning. Or, if the car is already off, the car will not engage and turn on. At times, corroded terminals of the battery may also prevent it from getting charged. In order to reduce the likelihood of this happening, check your battery at least once a month. Of all the car breakdowns each year, almost one-third of them are due to faulty or dead batteries. or credit card on hand. The best way to avoid this is to keep an eye on your fuel gauge and get your tank refilled as soon as it goes down. Tires are the only contact a vehicle makes with the ground, so a lot of wear and tear is to be expected. However, prompt monitoring of the pressure in the tire and the thickness of the tread can reduce the chances of this from happening. Should a leak or puncture occur, pull off the road to a safe place and call for roadside assistance. Or, if you know how, you can change and use the spare. Or, in the rare case that you have a puncture repair kit in your vehicle, use that to help patch the tire if there are no service stations nearby. The most annoying thing is when your car keys are either lost or locked inside your car. And, its happened to most of us – and chances are, it will randomly happen again. About 4% of the emergency calls made are because someone lost their keys; rarely do people carry a set of extra keys in their handbag or on their person. Frequent engine overheating can be quite frustrating to deal with. There are a lot of reasons that can cause this, but the most common is a faulty cooling system, or low levels of cooling fluid. If your thermostat is getting stuck, coolant fluid is leaking, or even the fan isn’t working properly, then you might have car trouble immediate ahead, especially on hot days. Before you begin a road trip, make sure your cooling system is all set and fluids are topped off to help avoid getting stranded. If you take proper precautions to avoid these failures, you will have a smoother ride and journey.